Whether we’re talking about on-site virtual assistants or those housed on third-party platforms like Facebook and Slack, chatbots have come to play a vital role in facilitating a positive relationship between brands and their customers. Most major companies have caught on to the trend as of late, too. According to a 2017 report from Forrester, 57% of companies surveyed currently use chatbots (or are at least planning on using them in the near future). This prevalence, however, does not necessarily mean things are all well and good. Facebook’s research on chatbot-related data found that the virtual assistants failed to meet the needs of the customer 70% of the time. Additionally, a 2017 study by LivePerson regarding consumers’ experiences with chatbots found that, while only 11% of consumers report having a negative experience, less than 40% of respondents reported an overall positive experience. In other words, more than half of the surveyed consumers reported that their chatbot-related experiences weren’t exceptional. Chatbots are becoming more prevalent, but there is a lot of room for improvement. In this article, we’ll go over the most important aspects of creating and implementing a chatbot into your overall marketing plan. We’ll also take a look at some of the innovative and effective ways major brands have already begun using chatbots, allowing you to see some of these best practices in action. Be sure that your customer’s goals for engaging with the chatbot align with your goals for implementing it; otherwise, you risk creating an innovative solution to a problem none of your customers actually have. Additionally, by clearly defining your chatbot’s purposes, it will be easier to determine the effectiveness of the tool over time – and be better able to make improvements along the way. These data points refer to the quantitative side of how your customers utilize your chatbot. Activation Rate measures the percentage of visitors to your site, Facebook page, etc. that engage with your chatbot in some way or another. You may choose to break down your definition of “engagement” even further, by considering how many visitors read a chatbot’s message versus how many engaged with the link or other content the chatbot provided. Even further, you might choose to take note of how many people engaged in “conversation” with your chatbot. Conversation Length While you’ll want to dig deeper into the context of these conversations (we’ll get into that in a moment), you can typically assume that customers who engage with your chatbot multiple times, and for longer periods of time, appreciate the value the tool has provided them. Volunteer Uses Typically, volunteer use of a chatbot is a sign that the customer in question came to your page or profile with a specific need in mind; again, you’ll want to dig deeper into these instances to discover exactly what these needs are. You’ll have created your chatbot with specific goals in mind. It only makes sense that you’d want to know whether or not you’re actually accomplishing these goals, right? The main metric to track here, is your chatbot’s Goal Completion Rate. Mind you, the goal we’re speaking of here refers to your goal – not your customers’. Again, though: these goals should intermingle in some way or another, and your goal for a specific engagement with a customer should depend on that specific customer’s needs. For example, if a customer voluntarily engages your on-site chatbot asking about the price range of your services, your goal almost may revolve around conversions. Or, if a customer is looking for initial information about your services, your goal might be to get them to sign up for your mailing list. Bot Confusion Rate refers to the number of times your chatbot was not able to answer a request due to technical limitations, as compared to its total number of engagements with visitors. For example, if a visitor asks for the price of your service, but you haven’t programmed your bot to provide this information, it won’t be of help. User Confusion Rate refers to the number of instances in which visitors ask questions that are outside the scope of your chatbot’s stated restraints. For example, if a chatbot provides a visitor with three choices as to how to move forward, but the visitor’s response has nothing to do with these options, this would typically count toward your User Confusion Rate. Human Fallback Rate refers to the rate at which a chatbot hands off a visitor to a human customer service representative. This handoff can occur at the visitor’s request (e.g., typing in “I’d like to speak to a human,” or something along those lines) or due to continued bot confusion (e.g., after three instances of confusion, the bot automatically connects the visitor to a human CSR). Note, however, that human fallback rate only applies to instances in which the chatbot’s goal is not met. If the chatbot’s goal is to nurture a customer toward the point-of-sale, but a human representative is necessary to confirm the transaction, this wouldn’t count as a human fallback. The most important thing to keep in mind when creating your chatbot’s “personality” is that your bot should act as an extension of your brand’s personality and voice. Along with this, your chatbot needs to speak to your customers in the manner in which they would expect a human representative of your brand to speak to them. Essentially, you want to take the Voice of Customer data you’ve collected, combine it with your customers’ literal vocabulary, and inject your brand’s own spin into the mix. If your brand were a person, how would you describe him/her (physically, emotionally, etc.)? How would your personified brand interact with others? What is your personified brand’s typical mood? How do you describe your target customer? What are your target customers’ thoughts, emotions, and needs with regard to your brand? Once you have the answers to these questions (and more) down, you’ll want to enlist the help of your copywriting team to actually create the dialogue your chatbot will use when interacting with your audience. The use of an emoji in the first message, along with the sympathetic vocabulary, maintains a conversational tone. Then, the bot follows this sympathetic message up with a more utilitarian directive to help the user along. Pro Tip: There’s no harm in reminding your visitor they are talking to a machine that has limited capabilities. Again, pretty straightforward. As the issue nears a resolution, the bot confirms that it was able to help, acknowledges the user’s confirmation, and opens the door for further interaction. Of course, it’s not possible to program your bot to handle every potential issue your customers may have – at least not with the technology that’s currently available. In many cases, a human handoff will be necessary at some point. Whether due to your chatbot’s inability to understand a command or provide a workable solution for a visitor’s problem, your customers are going to need to speak to a human customer service representative from time to time. The trick is to make this process as easy as possible for your visitors. Ensure your customers know they can speak to a human at any time during their interactions with your chatbot. 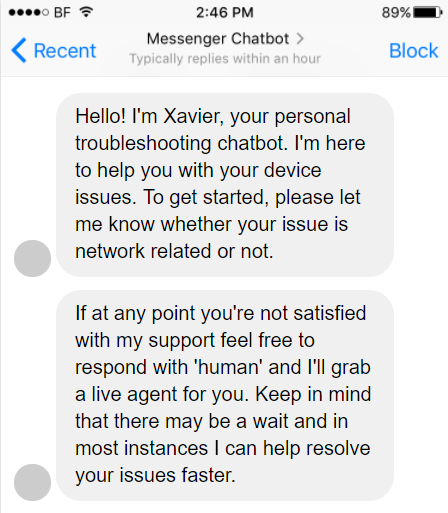 You also might want to program your bot to prompt a human handoff after a series of misunderstood queries from the user (ex: “I’m sorry, I’m having trouble understanding you. Would you like to speak to a human?”). While this will mean your chatbot has failed in this specific instance, it’s important to keep your eyes on the big picture: solving your customer’s issue, no matter what it takes. Chatbots are meant to provide convenience for your customers, and to increase their level of engagement with your brand – all while freeing up your support staff to focus on larger issues that can’t be tackled via automation. If, in a given instance, your chatbot isn’t providing convenience and is causing a customer to become disengaged, it’s essential your support staff is ready to jump in at a moment’s notice.